In 1907 while the writer was cultivating a field he found beautiful, large arrow points near the spreading oak. His mother told him that the Indians had had a camp here. Near the oak is an Indian grave, and a variable fountain of cold water. "A stone burial ground constructed by pre-historic Indians was opened in October 1962 by F. R. Corliss Jr. and Robert Brenneman. 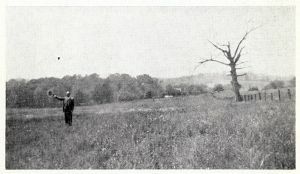 The mound was located on the Troxell Tichnell farm overlooking Folly Run about three miles south-west of Bloomington. Corliss said two flexed burials were found, each facing the Northeast, and resting in pits whose sides were lined with slabs of sandstone set on edge. One of these burials had a triangular arrow-point in the rib area, a point of clear crystal quartz lay near the skull. The other burial had a wing-bone of a snow goose resting on the skull which indicated a feather head piece."